Monday May 24th, 2010 will mark two years open for Toronado San Diego. I stopped in just a day or two after they opened and was blown away with all the great beer and nice atmosphere. I can’t remember what I drank, but I do remember one funny thing about that night. After a few beers with a friend it was time to use the bathroom. I walked in, used the urinal and nothing seemed out of the ordinary. As I walked over to wash my hands, I looked at the mirror, and then down where the sink should be. Instead of an actual sink was a counter with a sink shape hole in it. But they had bar-goers covered, sitting on the counter was a bottle of hand sanitizer. The next time I stopped into Toronado the sink had been installed and the place was immaculate. The anniversary party at Toronado starts tonight at 6pm with plenty of Sierra Nevada brews on tap: Life & Limb, Wood-aged Empire Strikes Black, Bigfoot Barleywine, Fritz & Ken 30th Anniversary Stout, Dark Forces, Summerfest Lager. Sierra Nevada Pale Ale will be on tap all weekend for just $3 a pint. That’s just the beginning though. Toronado has been saving all sorts of great beer for this weekend. Click below to see the full list of kegs they’re planning to tap throughout the weekend. And follow them on Twitter @ToronadoSD to hear what’s going on tap and when. 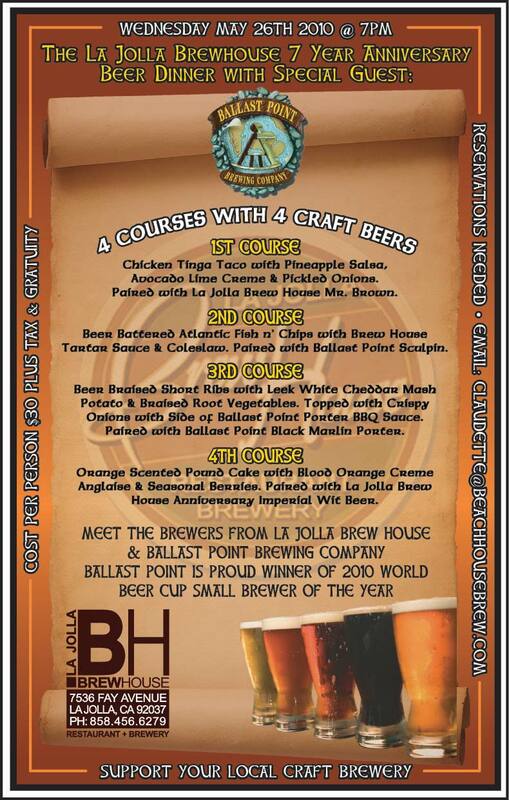 This time next week La Jolla Brew House will be celebrating their 7 year anniversary. They’ll be hosting a beer dinner and have paired up with Ballast Point Brewing Co. to pair four courses with their own house beers and those from Ballast Point. Just a quick post to note that the 6th DrinkAbout is happening tonight from 7pm-11pm at Blind Lady Ale House, Small Bar, Live Wire, Toronado, Sea Rocket, The Station, Hamilton’s and Ritual Tavern. If you’ve never been to the DrinkAbout it’s well worth it, and this one should be especially good because of American Craft Beer Week. For four hours there will be free shuttle buses (provided by Brewery Tours of San Diego) picking up and dropping off passengers at each of the above listed bars every 30 minutes. Most of the bars have beer and/or food specials and the atmosphere is great. I was lucky enough to be visiting in December when the first DrinkAbout happened and it showed me just how far the San Diego craft beer scene had come since I moved away. You can’t go wrong with the beer selection at any of the bars tonight, but Blind Lady Ale House looks like it might have the best lineup with a Lost Abbey showcase. Posted by Jeff Hammett in beer u, blind lady ale house, coronado brewing co., dogfish head brewing co., events, firestone walker brewing co., green flash brewing co., hamilton's tavern, karl strauss brewing co., pizza port, san diego beer week, san diego brewing co., sierra nevada brewing co., stone brewing co. This week, May 17-May 23rd is American Craft Beer Week, and just as the name suggests it’s a week long celebration of craft beer across the entire country. Various breweries and bars are holding special events to celebrate and of course San Diego is no exception. Below are some highlights of events happening around San Diego County this week. Check out the American Craft Beer Week website for more events. And don’t confuse American Craft Beer Week with San Diego Beer Week happening November 5-14th (and don’t miss San Diego Beer Week’s sneak preview weekend June 10th-13th). Stone Brewing Co. will hold Stone Southern California Storm, with all 32 of their taps featuring beer from Southern California Breweries all week long. Like many breweries around the country, they’ll also have a Declaration of Beer Independence hanging in the lobby for folks to sign. Karl Strauss Brewing Co. brewed up a Belgian IPA for American Craft Beer Week that will be on tap all week at various bars and on cask at their restaurants. They’ll also have guest casks on throughout the week. Coronado Brewing Co. will have their Big Barrel Stout, an Imperial Stout aged for six months in bourbon barrels as well as their Old Scallywag Barley Wine on tap. In addition to Stone Southern California Storm, Stone Brewing Co. will also be hosting a Beer U class, Beer 101: The History of Beer from 7-9pm. Tickets are $20. Small Bar will have $2.50 half pints of nine classic American IPAs both Tuesday and Wednesday. The IPAs include Dogfish Head 90 Minute IPA, Coronado Brewing Co. Idiot IPA and more. Blind Lady Ale House will tap the 2010 release of Firestone Walker Parabola, a barrel aged Russian Imperial Stout. They’ll also have other Firestone Walker brews on tap including Double Barrel Ale, Pale 31, Union Jack IPA and more. If you missed Parabola Tuesday at Blind Lady Ale House, Pizza Port Carlsbad has you covered. They’ll be tapping the 2010 release of Firestone Walker Parabola as well as having plenty of other Firestone Walker beers on tap. San Diego Brewing Co. will toast 30 years of Sierra Nevada Brewing Co. with the Sierra Nevada/Anchor Steam collaboration Fritz and Ken’s Ale, a big dark, Imperial Stout. Hamilton’s Tavern will host a cask of Green Flash Brewing Co.‘s Palate Wrecker and 9-10% ABV Double IPA. As for Saturday and Sunday check out some of the week long events. Welcome to SanDiegoBeerBlog.com. My name is Jeff Hammett and I’m a beer geek. You can read a little bit about me and this blog on the About page, but I thought I’d write a little bit more in this first post to introduce myself. I grew up in the craft beer mecca that is San Diego. I’m fairly young, but so are most of San Diego’s craft breweries. When I came of age there were only a handful of craft breweries in San Diego. My first positive experience with beer was Stone Brewing Co.’s Stone Pale Ale. Like most teenagers I drank some beer in high school, Miller, Coors, Budweiser, but hated it. After I tried that first craft beer I knew it would be a life long obsession. Since then I’ve spent some time in San Diego, watching the beer scene grow. Traveled a bit and am just now returning to San Diego after spending some time in Durango, Colorado. I cut my teeth beer blogging out in Colorado, Durango specifically which has four breweries and about 20,000 people. I grew my blog Beernbikes.com steadily over the time I was blogging and learned quite a bit about the craft beer industry. I’ve been homebrewing for a while now, which has taught me plenty about beer that I would have never learned just drinking it or even reading about it. I even got to brew a batch of beer with headbrewer Thomas Larsen at Ska Brewing Co. in Durango as a Beer Blogger – Brewery collaboration. With my move back to San Diego I’ve decided to change the focus of my blog a bit, with a focus on beer and San Diego specific beer news and information. If you have beer news or anything else you’d like to talk to us about, send us an email, we’d love to hear from you. You can also fill out the contact form at the bottom of the About page.